This comes as Zambia introduced testing of travellers’ stool before admitting them into the country, offering laxatives as a way of speeding up the process. Zambia has resorted to giving Zimbabweans laxatives in a bid to test them for cholera before they can enter the country, but Zim vendors appear to have found a way of offering travellers an enterprising yet not very sanitary solution – selling cholera-free poo, DispatchLive has reported. “I just can’t take laxatives when travelling. Who does that? You won’t get a once-off running tummy but you are almost confined to a toilet all day as your bowels tend to be very loose,” said an anonymous trader, who crosses the border to sell goods in Zambia. “In as much as it was unthinkable‚ I paid $5 to buy a teaspoonful of stool and it was tested and I passed through‚” he continued. Those seeking a living as poo-providers for this burgeoning business were, however, sent into early retirement after Zambia has ceased testing travellers at the border. A statement from the Zambian health ministry assures Zimbabwean travellers “that they would not be unnecessarily subjected to taking any drugs or vaccine; neither will they be required to submit stool at the border entry point”. This may be good news for travellers, but “pootrepeneurs” see the lost opportunity as a waste. “I could sell about 40 portions of stool on a good day at $4 to even $10. People did not want to take laxatives so it was good for us. Now that things are back to normal‚ its back to airtime and SIM card vending for me‚” one vendor said. 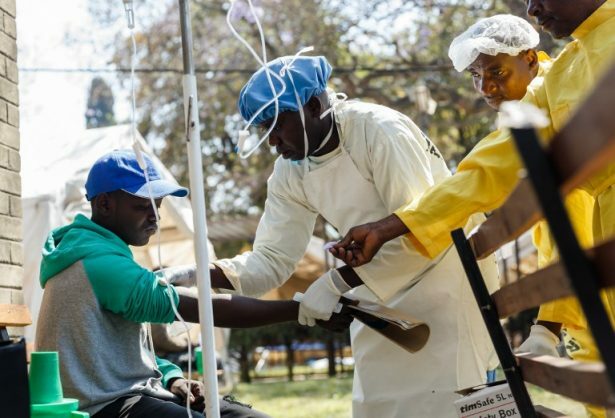 Zimbabwe is undergoing a cholera outbreak, with the World Health Organisation (WHO) reporting that 50 deaths have been recorded so far. According to the organisation, an additional 4,914 cases have been reported including 92 laboratory-confirmed cases since the last stats were published in September. The WHO says that, as of October 3, 8,535 cumulative cases have been reported, 163 of which have been confirmed by laboratories, 98% of which came from the country’s capital, Harare. “Contaminated water sources, including wells and boreholes, are suspected as the source of the outbreak,” the organisation’s website says.